Angi plays the harp twice a week at Northside Hospital in Atlanta, where she can be seen pushing her harp cart throughout the hospital. She plays in patients’ rooms and in all the medical departments including pre-op & recovery, intensive care, the ER, oncology, bone marrow transplant, and neo-natal intensive care, as well for newborn babies and their mothers. Each month she plays in the infusion area of NH's Cancer Center. She has also played at Piedmont Hospital and Children's Hospital of Atlanta, plus many other hospitals and hospices. 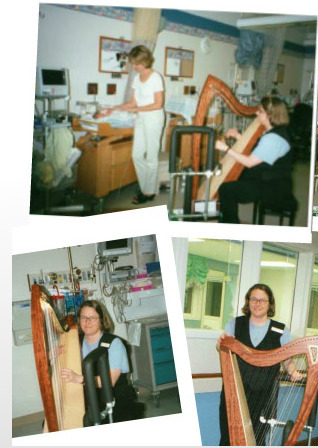 The presence of harp music helps to calm the patients and their families. The doctors and nurses often comment about its effect – they find themselves relaxing, in addition to seeing improvements in some patients’ pulse rates, blood oxygen absorption levels, and peace of mind.